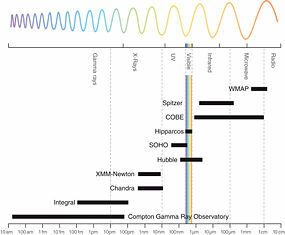 Space Observatories and their wavelength working range. A space observatory is an artificial satellite equipped with instruments designed for the observation and study of objects and phenomena in outer space or to study the Earth's atmosphere. Astronomical observations from the Earth's surface are hampered by the filtering and distortion of electromagnetic radiation by the Earth's atmosphere, and light pollution from artificial light sources on Earth. The only two wavelength ranges of the electromagnetic spectrum that are not severely attenuated by the atmosphere are the visible light and radiowave regions. The infrared, ultraviolet, X-ray, and gamma ray regions of the spectrum are highly blocked. Space observatories operate from beyond the Earth's atmosphere and are therefore not hampered by atmospheric interferences. Many space observatories have been launched into Earth orbit, some designed to map (survey) the entire sky, others focusing on certain parts of the sky. Some have already completed their missions, while others are still operating. Together they have greatly enhanced our knowledge of the cosmos. Such observatories have been launched and operated by the U.S. National Aeronautics and Space Administration (NASA), the European Space Agency (ESA), Japanese Space Agency (JAXA), and the Soviet space program later succeeded by Roskosmos of Russia. Spitzer, Hubble, and XMM-Newton telescopes, depicting their most important parts. The Hubble Space Telescope (HST) is the optical Great Observatory, launched on April 24, 1990. ESA is NASA's partner in the HST project. The Compton Gamma-Ray Observatory provided several years of productive life before it had to be disposed of. Its gyroscopes began to fail and when it was down to its last gyroscope, the choice was to risk losing control or destroying the observatory. NASA de-orbited the bus-sized satellite into the Pacific Ocean in 2000. X-Rays are also represented in the Great Observatories, with the Chandra X-ray Observatory (CXO), renamed (from AXAF, Advanced X-Ray Astrophysics Facility) in honor of the great Indian astrophysicist Subrahmanyan Chandrasekhar. This has been used to great effect to study distant galaxies and is still operational. The Space Infrared Telescope Facility, (SIRTF), launched on August 24, 2003, is the fourth observatory and is called the Spitzer Space Telescope (SST). IRAS performed an all-sky survey in infrared, as well as discovering disks of dust and gas around many nearby stars, such as Fomalhaut, Vega and Beta Pictoris. IRAS ceased functioning in 1983 and continues to orbit at a height near 800 kilometers. Orion 1 and Orion 2 Space Observatories were Soviet space observatories that operated onboard space station Salyut 1, 1971, and Soyuz 13, 1973, respectively. Astron (spacecraft), a Soviet ultraviolet telescope, operated from 1983 to 1989. Granat, a Soviet X-ray and gamma-ray telescope complex, operated from 1989 to 1998. ISO (Infrared Space Observatory), an ESA (European Space Agency) mission, followed IRAS and carried out observations at infrared wavelengths. 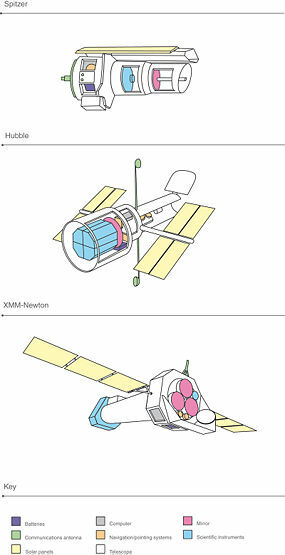 XMM-Newton (X-ray Multi-Mirror Mission - Newton) is an orbiting X-ray observatory, named in honor of Isaac Newton. Originally known as the High Throughput X-ray Spectroscopy Mission, it was launched by the ESA on December 10, 1999. COROT space telescope is a French Space Agency/ESA observatory that was launched in December 2006. It is the first mission to search for rocky worlds around other stars. IUE (International Ultraviolet Explorer), was an ESA/NASA/UK observatory that launched in 1978 with a planned lifetime of three years. It was eventually switched off in 1996. Solar and Heliospheric Observatory (SOHO) is a solar observatory that is currently operational and used for the study of the Sun's corona and magnetic environments. SOHO has revolutionized our knowledge of the Sun. SCISAT-1 is a Canadian satellite that observes Earth's upper atmosphere with an optical Fourier transform infrared spectrometer. Uhuru was the first (1970) X-Ray space observatory. HEAO (High Energy Astronomy Observatories) 1 and 2, were subsequent (1977, 1978) X-Ray space observatories. Hipparcos was a satellite for measuring stellar parallax. Despite significant operational problems, it revised the Cepheid variable star distance scale to great accuracy and has been invaluable for all branches of observational astronomy by furnishing scientists with extremely accurate "standard candles" for measuring distances. Microvariability and Oscillations of STars telescope (MOST) was launched in 2003 for the Canadian Space Agency. It is the smallest space telescope in the world, being the size of a small chest or a very large suitcase. It is expected to operate for five years. The ASTRO-F Space Telescope, built by the Japan Aerospace Exploration Agency (with some Korean and European involvement) was launched in February 2006, and will make a deep map of the whole sky at mid infrared and far infrared wavelengths. The Swift Gamma-Ray Burst Mission was launched in 2004 to detect and study gamma ray bursts. The Herschel Space Observatory will be launched by the European Space Agency in 2008 to study the far infrared and submillimeter wavelengths. The James Webb Space Telescope is intended to replace the Hubble Space Telescope and is planned for launch no earlier than June 2013. Christensen, Lars Lindberg, and R. A. E. Fosbury. 2006. Hubble: 15 Years of Discovery. New York: Springer. ISBN 9780387285993. Davies, John Keith. 1997. Astronomy from Space: The Design and Operation of Orbiting Observatories. 2nd ed. Chichester, UK: Wiley. ISBN 0471962589. Kerrod, Robin, and Carole Stott. 2007. Hubble: The Mirror on the Universe. Richmond Hill, Ontario: Firefly Books. ISBN 9781554073160. Naeye, Robert. 2001. Signals from Space: The Chandra X-ray Observatory. A Turnstone Space Explorer Book. Austin, TX: Raintree Steck-Vaughn. ISBN 0739822152. Voit, Mark. 2000. Hubble Space Telescope: New Views of the Universe. New York: H.N. Abrams, in association with the Smithsonian Institution and the Space Telescope Science Institute. IBSN 0810929236. Era of Space Telescopes – Space Telescope Science Institute. A Brief History of the Hubble Space Telescope: Why a Space Telescope? – NASA. This page was last modified on 14 October 2015, at 16:14.